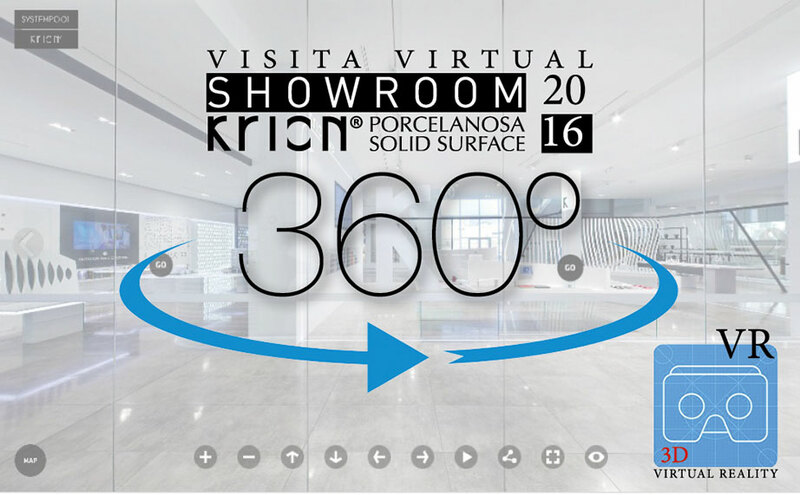 As with every year at this time, we are proud to be able to present the new KRION® Showroom 2016 Virtual Visit. It is satisfying for us, as it is the work of all employees of SYSTEMPOOL/KRION, combined in one exhibition. The marketing designs, the assembly by our workshop colleagues, the suggestions of the commercial departments, and the developments of the project and product department; hundreds of hours with the single aim of presenting our compact mineral KRION® in the best way possible for our clients. All of this work is a commitment with the individuals who visited our trade fair and who visited us throughout the year, the individuals who are awaiting this virtual visit to see every corner of the Showroom, and generally for those who want to learn more about the compact mineral from PORCELANOSA Group, KRION®. A new aspect is the visit being offered in VR format. With just cardboard glasses you will be able to visit our exhibition as if you were really in our facilities. KRION Showroom 2016 VR – an unforgettable experience.